Wow this book was not at all what I expected from the companion to Austenland. I loved this book, but for entirely different reasons than the first book in this series. In the first book, the focus was on the love story of the main character, and followed how she traveled to Austenland and fell in love with one of the men. This time Charlotte is a little different than our last heroine. Charlotte is bold, a little too smart for her own good, and getting over a major heartbreak. I really liked Charlotte's character. To be honest, there were many times in the book when I wanted to reach into the pages and shake her, but I consider that a good thing. Charlotte gets caught up in a mystery when the guests turn all the lights out in the house for a little pitch black hide and seek- poor Charlotte comes upon a dead body- but the next morning it is gone and noone believes her! I really enjoyed the mystery within a mystery in this story, and honestly couldn't tell for a majority of the story if Charlotte was really just going bonkers. Like all of Shannon Hale's other works the action, conversations, and timing flows naturally. There is a bit of a love interest- but it is absolutely unexpected and surprised me. There are many mysteries and surprises in this story. 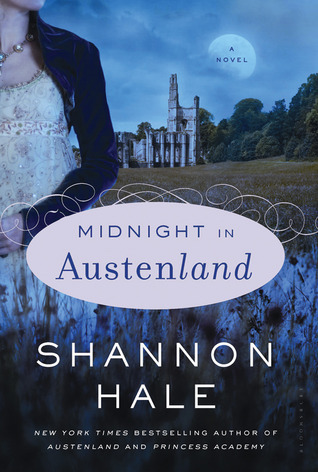 It isn't necessary to have read Austenland first, but I think it would benefit the reader to read the stories in order (it would ruin the first book if you read Midnight in Austenland first). Any fans of contemporary literature, clean romances, or the young adult author Shannon Hale will devour this story! Thanks! Have you read the first book in the series? I think you will love them!